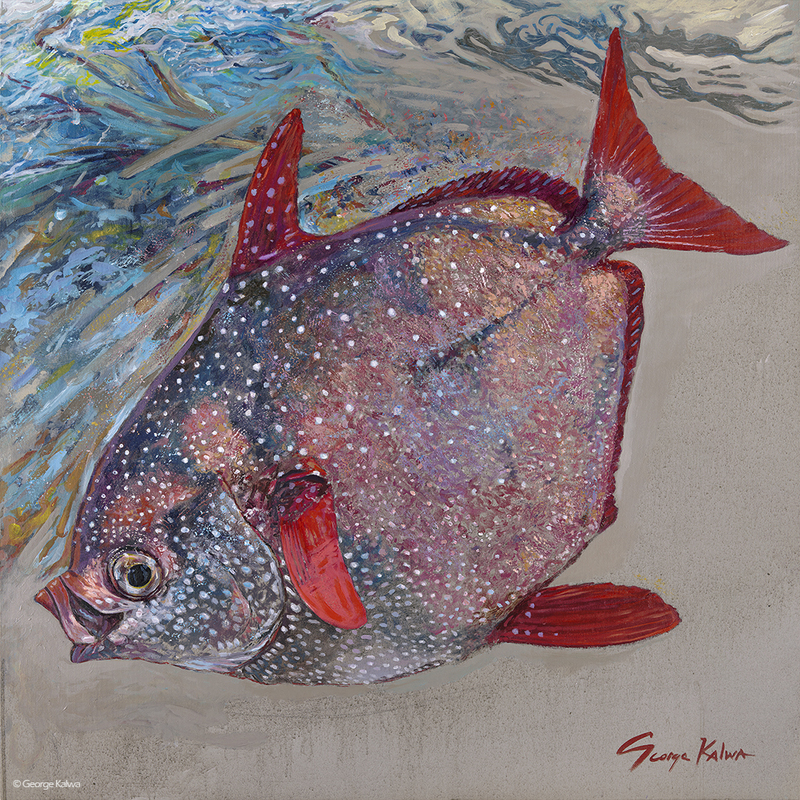 36" x 36" Acrylic on canvas The Opah is a Pacific ocean species. 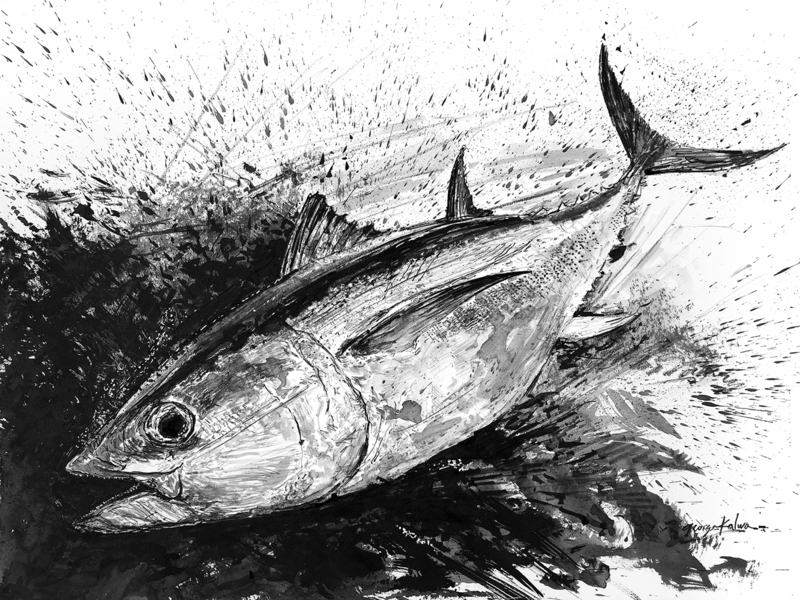 My painting is a portrait of the Opah that was caught surprisingly last year not far off the Atlantic coast of Ocean City, Maryland. 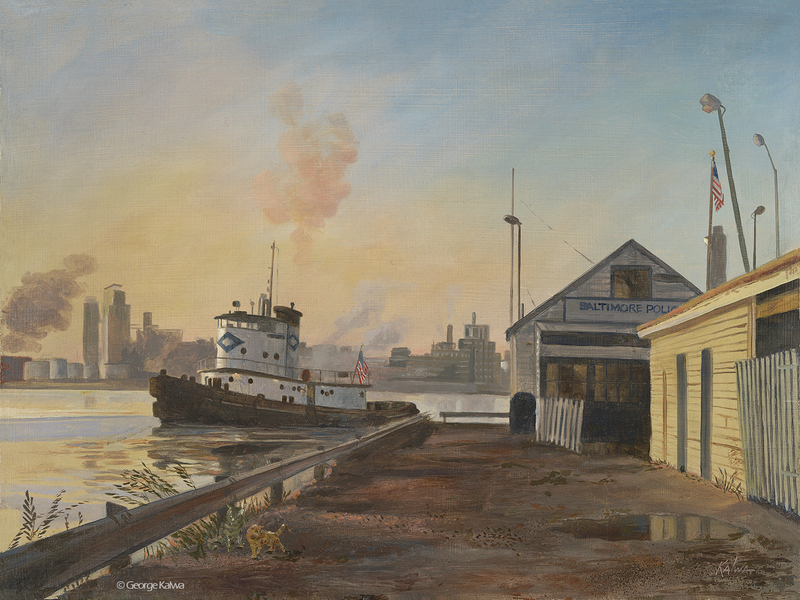 George Kalwa was born in Baltimore, and graduated from the Maryland Institute College of Art in 1978 GFA. 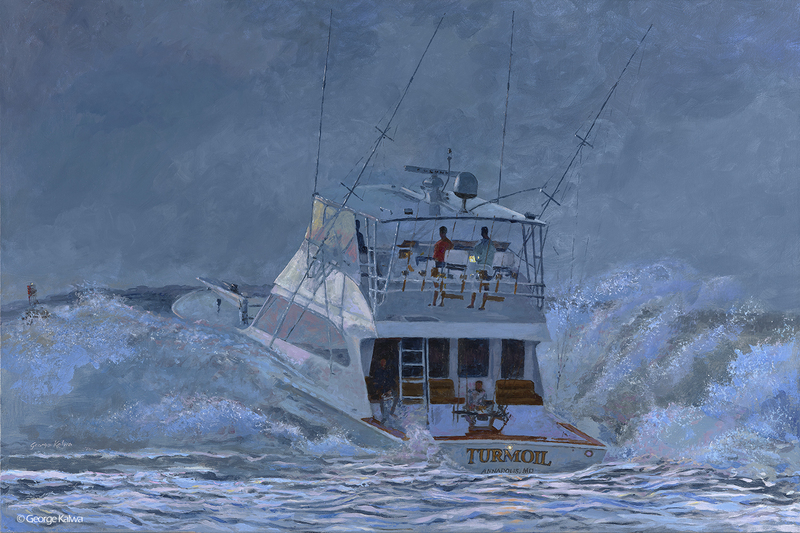 He worked as a court room illustrator, portrait painter, sign maker, then became a broadcast designer, animator and Film Maker spending a lot of his time in the ocean where he created an offshore fishing tv show. 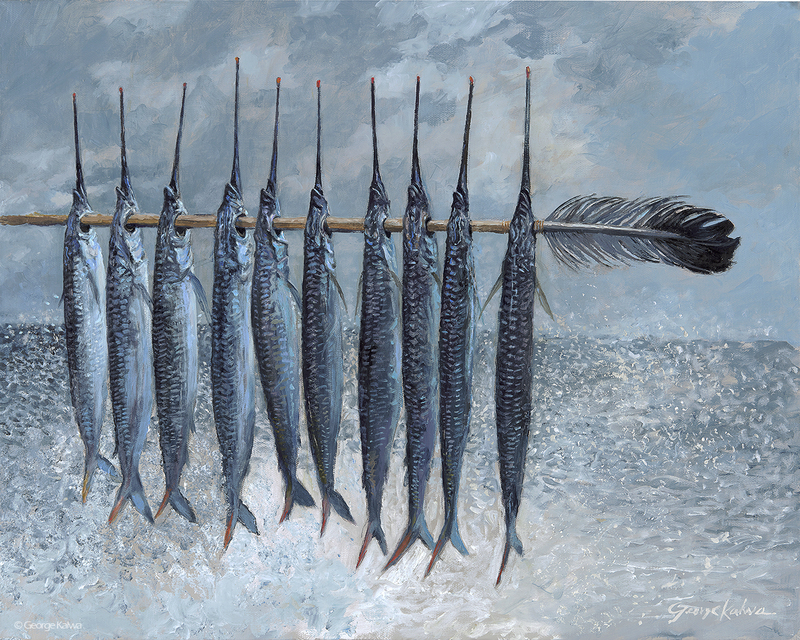 Now he paints from his vdeography and photography. 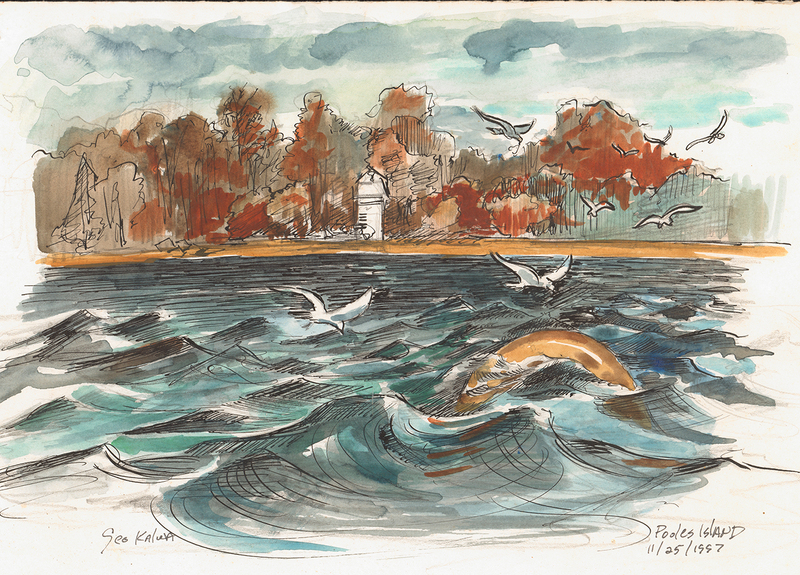 His love for water, the ocean life constantly inspires his work. 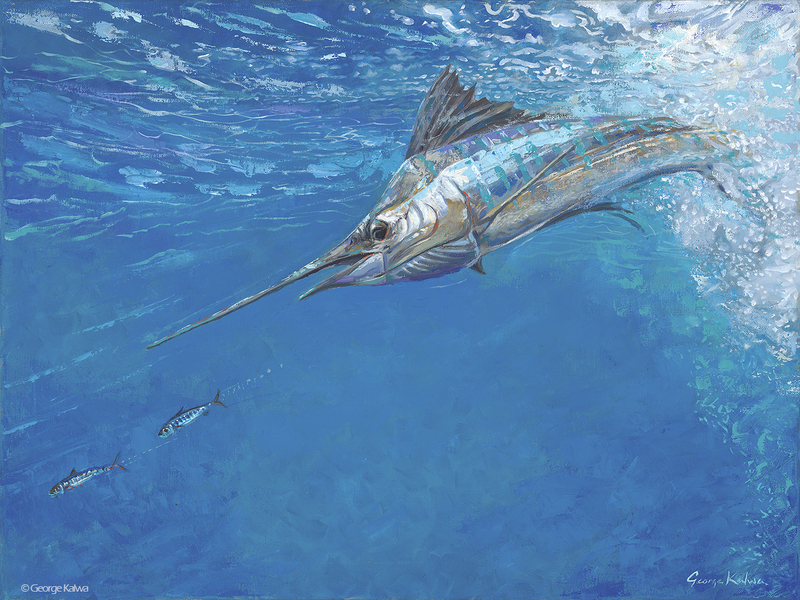 The Ocean's surface is a mirror, reflecting light, colors, and life above. It is translucent, allowing light to pass through and illuminate life beneath. 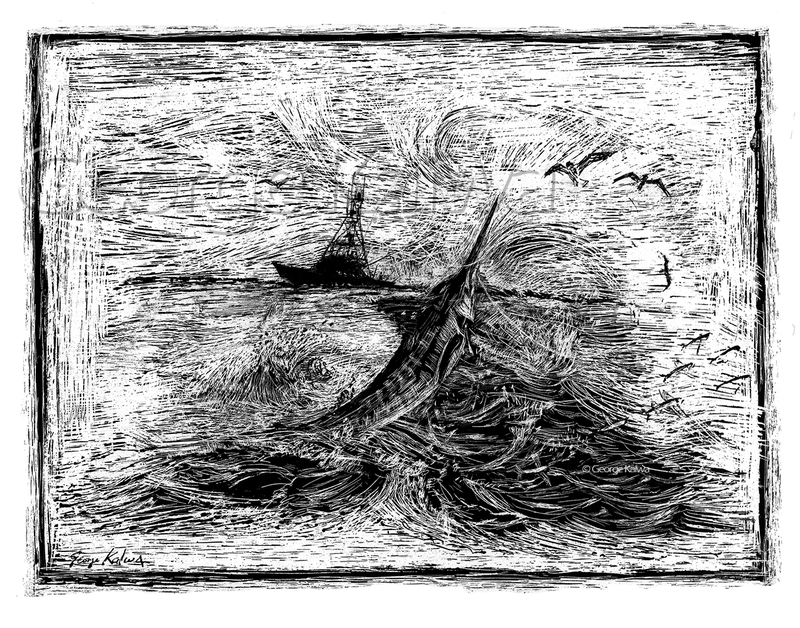 The great and beautiful sea inspires and challenges me to understand and record it's power and beauty. There is much movement. Nothing is still. 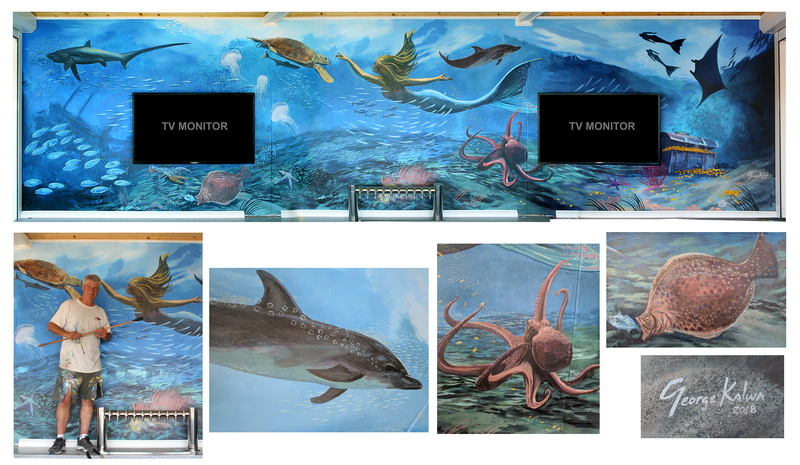 Paint is like the ocean. It's fluid and moves like water. Colors interact like birds and fish and whales. 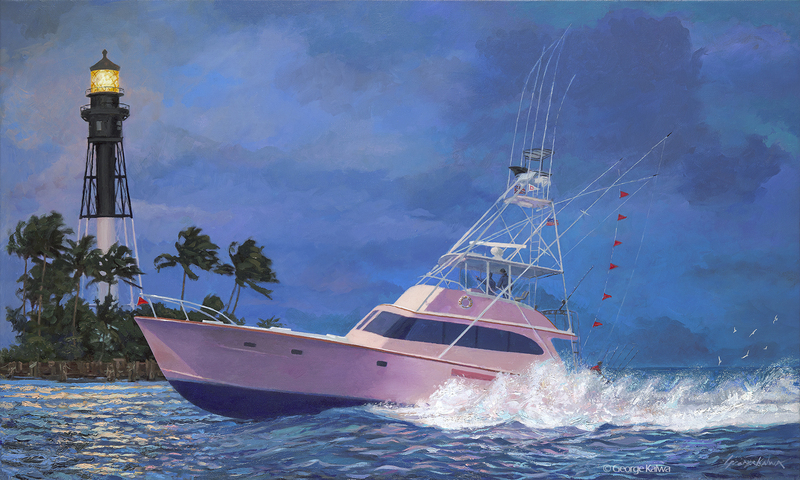 Sixty miles offshore is another world filled with unimaginable beauty, stimulating every human sense. 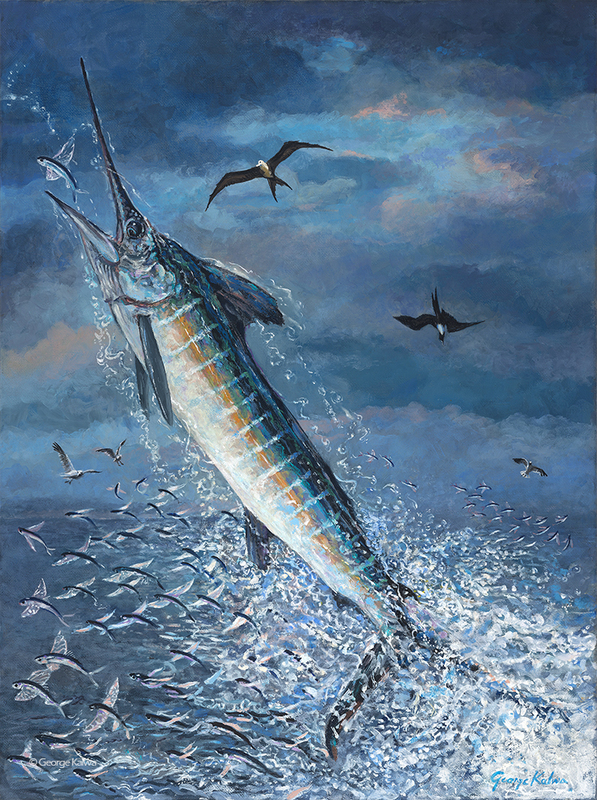 18" X 36" Oil on Canvas White Marlin release depicts the beauty of light and color as the fish is resting just after being released. 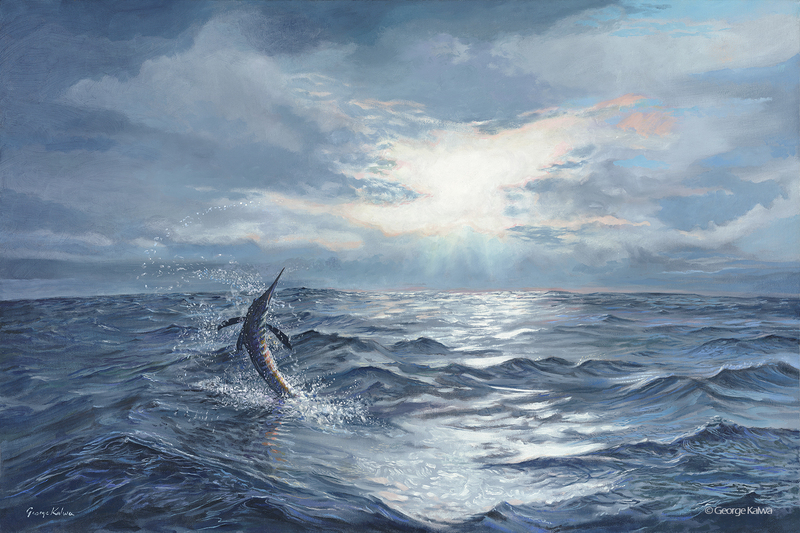 24" x 36" Oil on canvas White Marlin dancing as the morning sun rises. This beautiful fished jumped eleven times while I captured the action with my video camera. 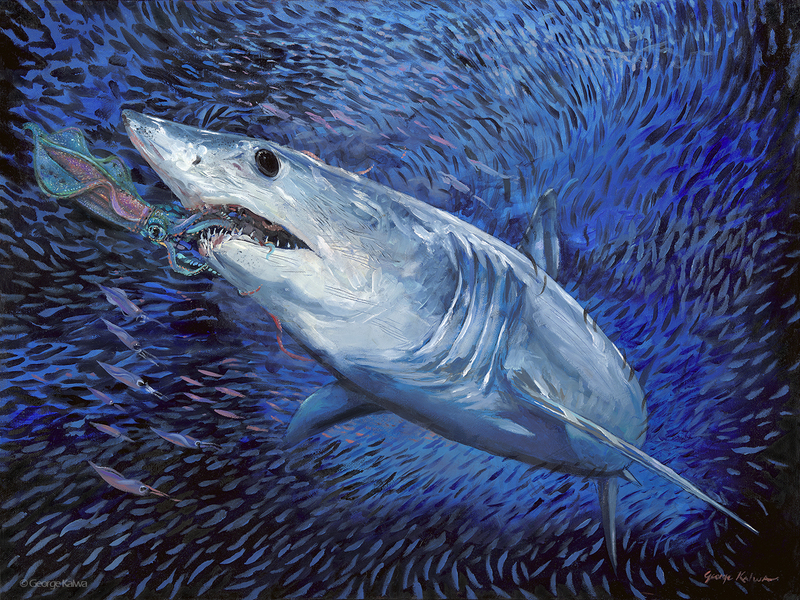 It was then carefully released to its home in the Atlantic. 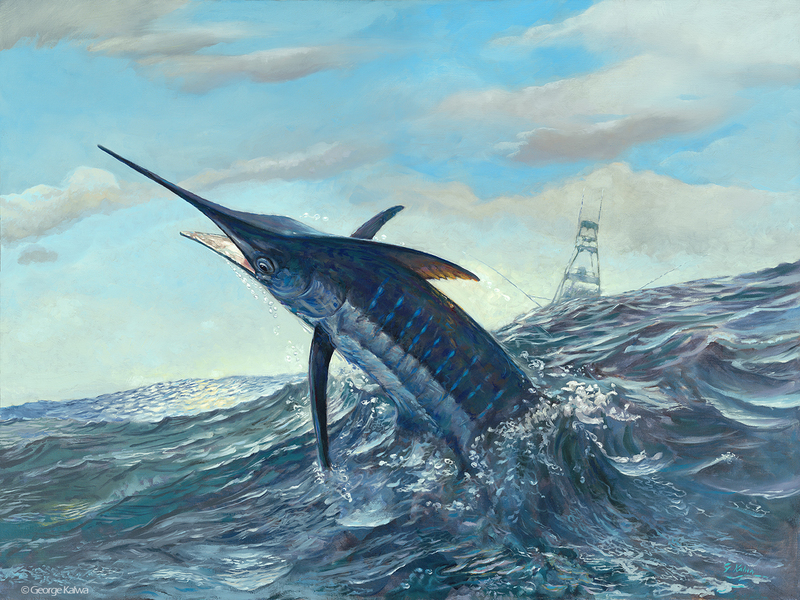 18" x 24" Oil on canvas Sailfish chasing one of its most sought after foods, the sardine. 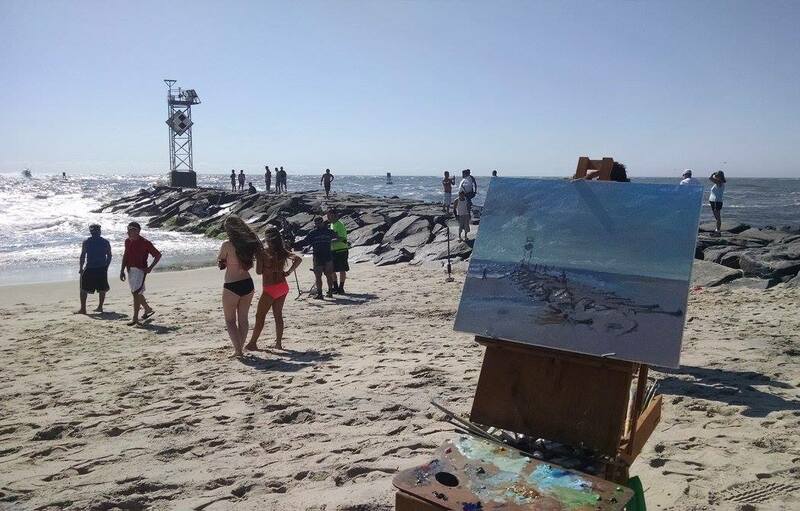 I love painting "En Plein Air". 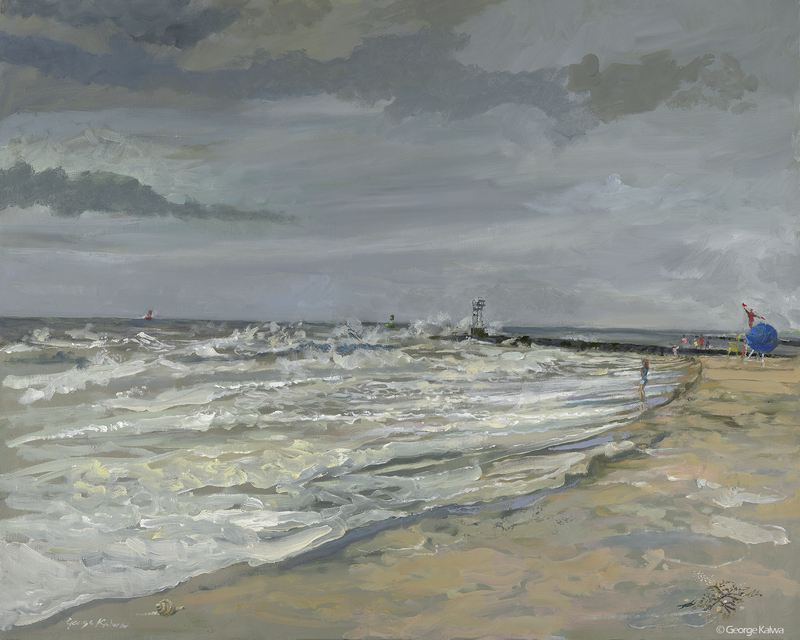 Onsite painting competitions are always very exciting as they challenge me with time constraints, bad weather at times, moving skies and changing light. I try to record some type of action into the landscape. 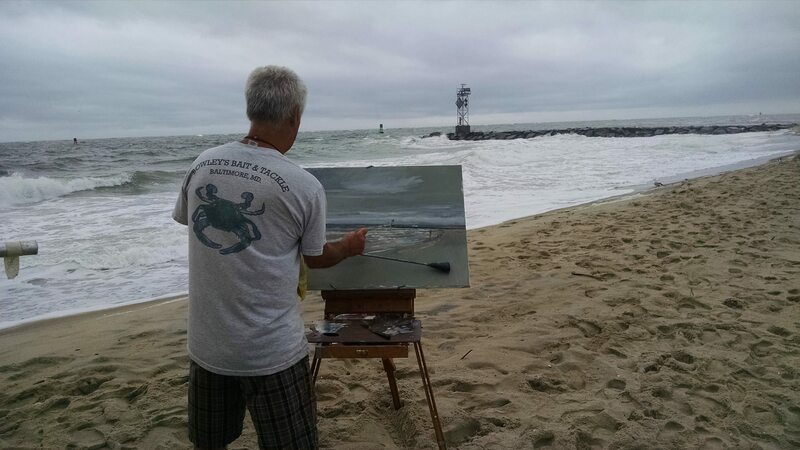 This was a 2 hour time limit "Quick sketch" competition in Ocean City, MD With 15 minutes left people started to scream "call 911 someone is drowning" I captured the action as lifeguards raced to save the young mans life. 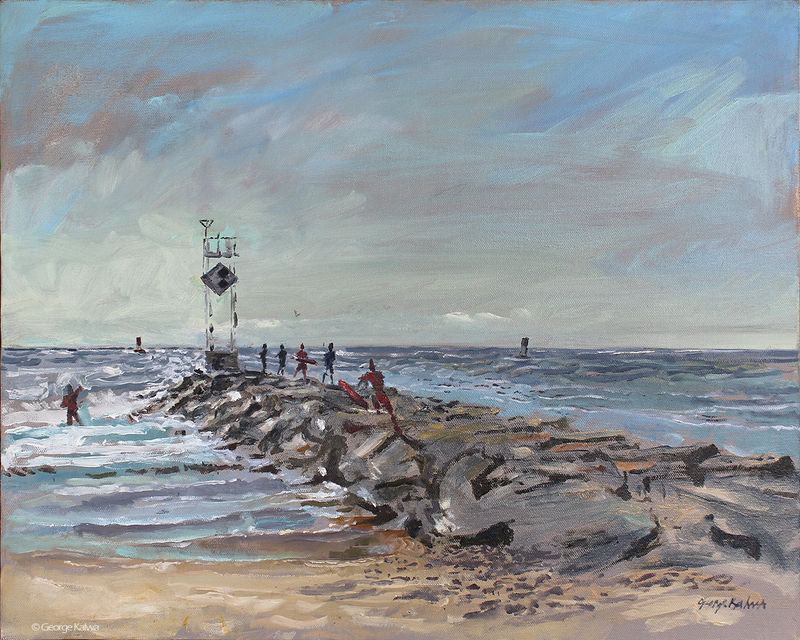 The experience was exhilarating as it took me back to my "Courtroom artist days"
12"x 16" Oil on Panel Fells Point Painted in 1983 When I was young, I lived in fells point and did many paintings of this beautiful old town. 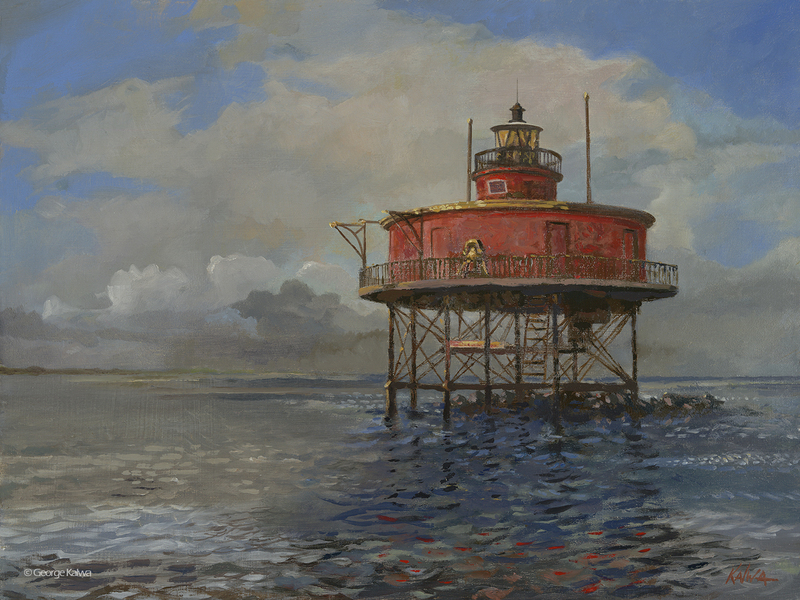 12" x 16" Oil on panel Seven Foot Knoll Lighthouse, Chesapeake Bay I fished many times with my three sons at this lighthouse. 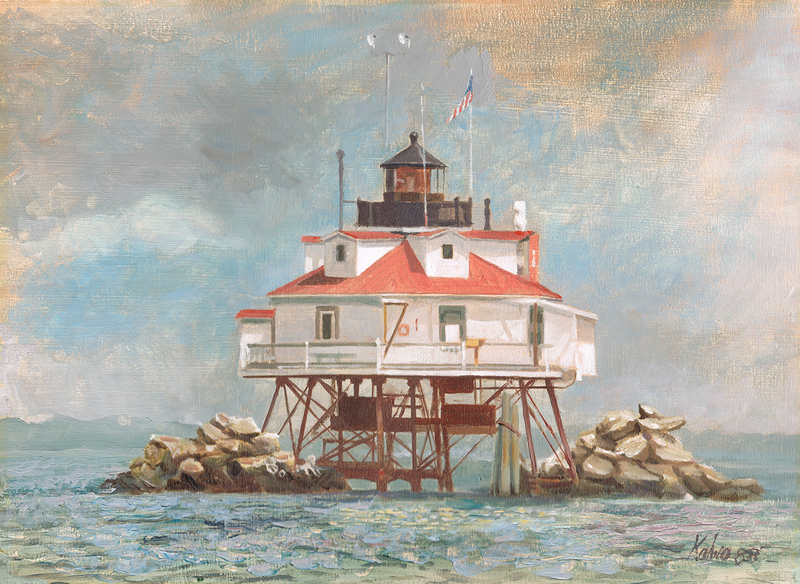 We would catch Rockfish, Blues, occasional Seatrout, Perch and Catfish Painted around 1983 before it was removed from the bay. Now it is a museum at the Inner Harbor in Baltimore. 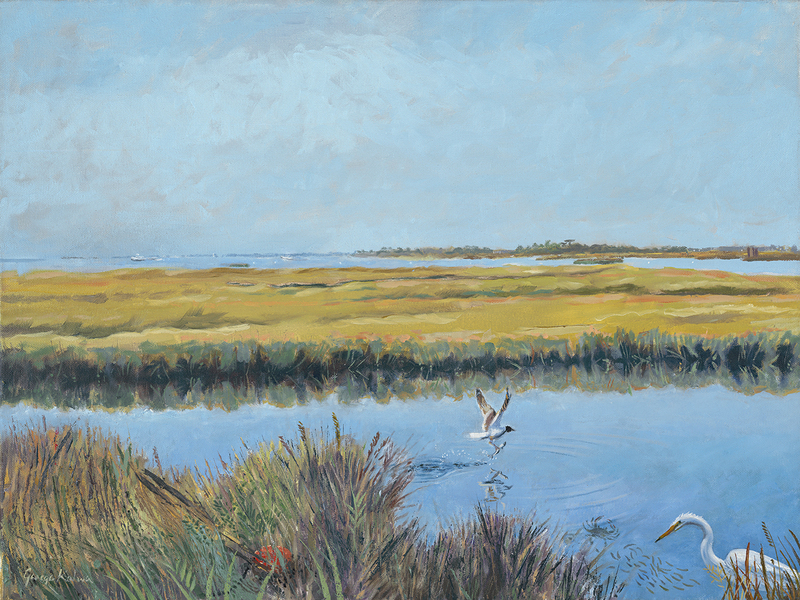 18" x 24" Oil on canvas marshlands along route 54 Fenwick Island Delaware. A working bird picks up a Finger Mullet in August. 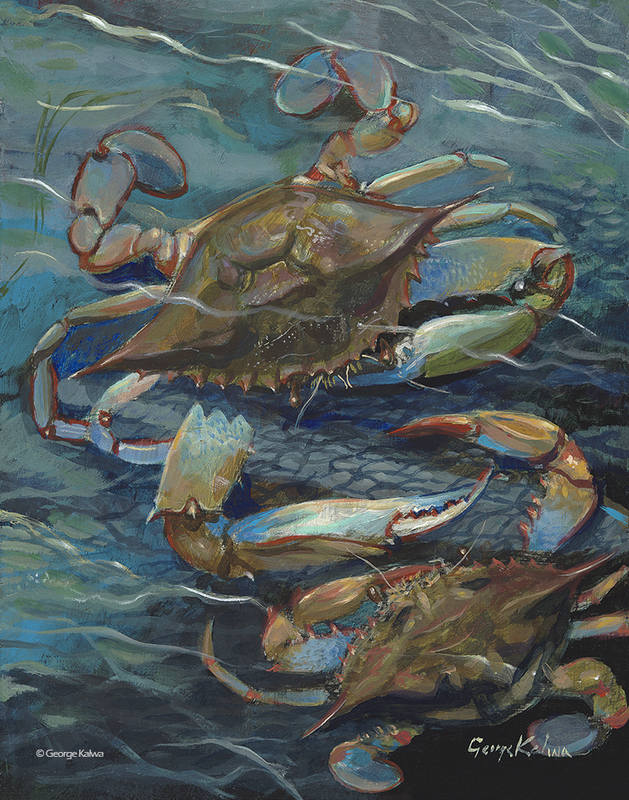 Birds, fish, crabs, mussels, Horsehoe Crabs, Clams are abundant in this area. 16" x 20" Oil on canvas. 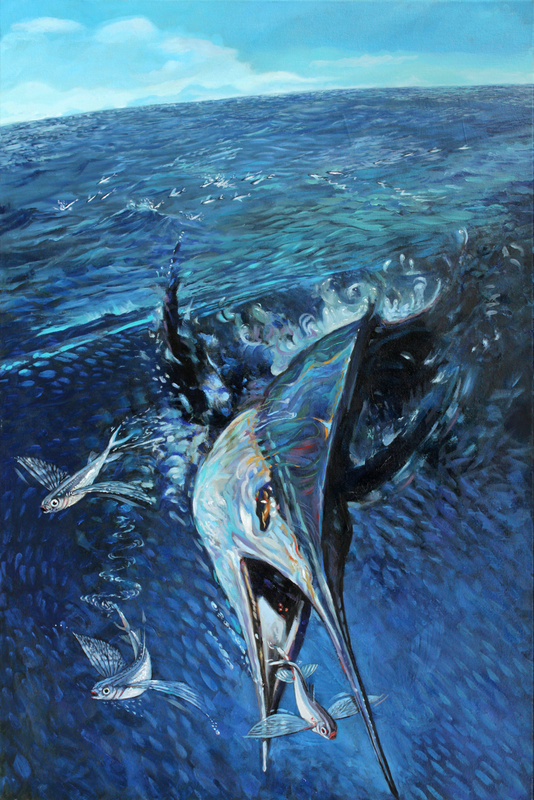 "Mermaid's Escape" depicts her adventurous ride on her friend, the sailfish as she hides from the dangerous hammerhead shark above. 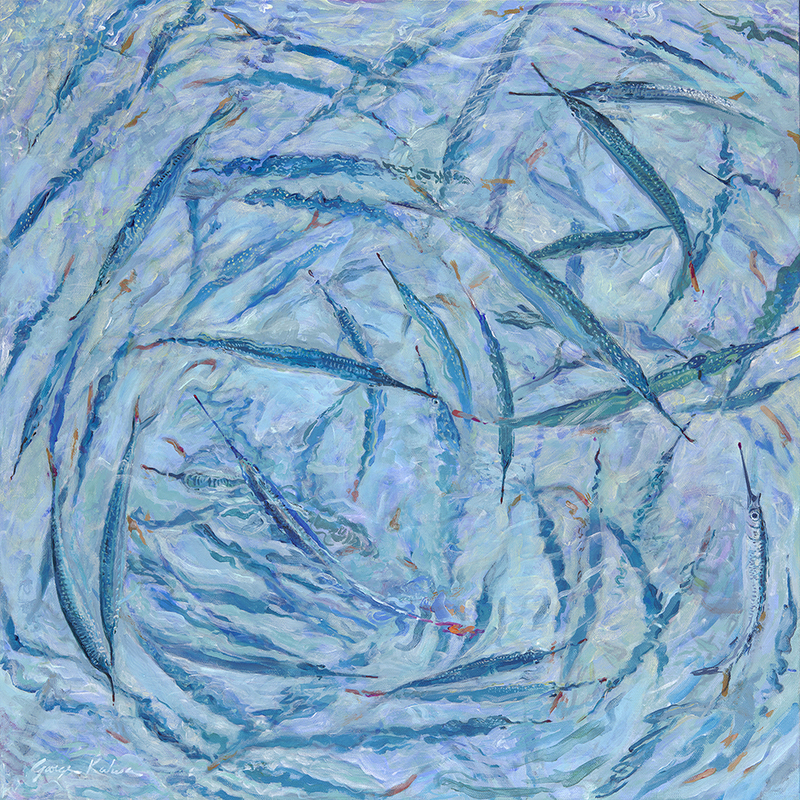 Swimming among schools of skipjack tuna, Squid and sardines. 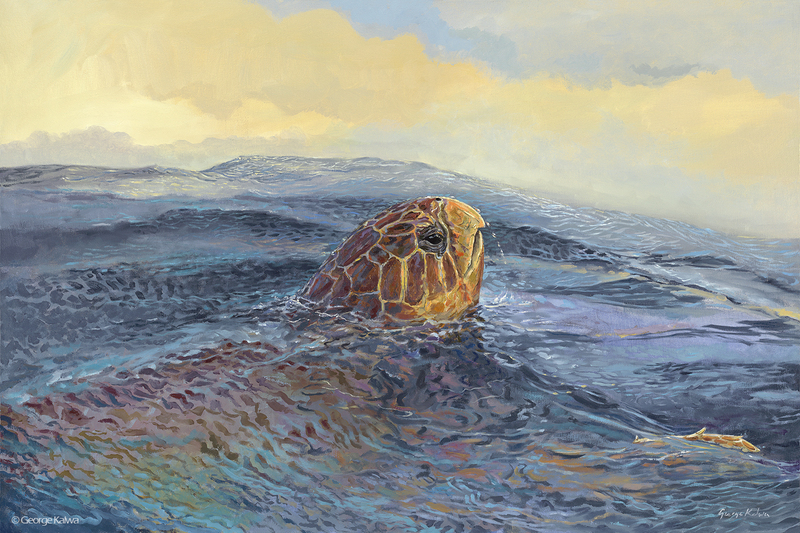 also in the painting is a loggerhead sea turtle over a remora. 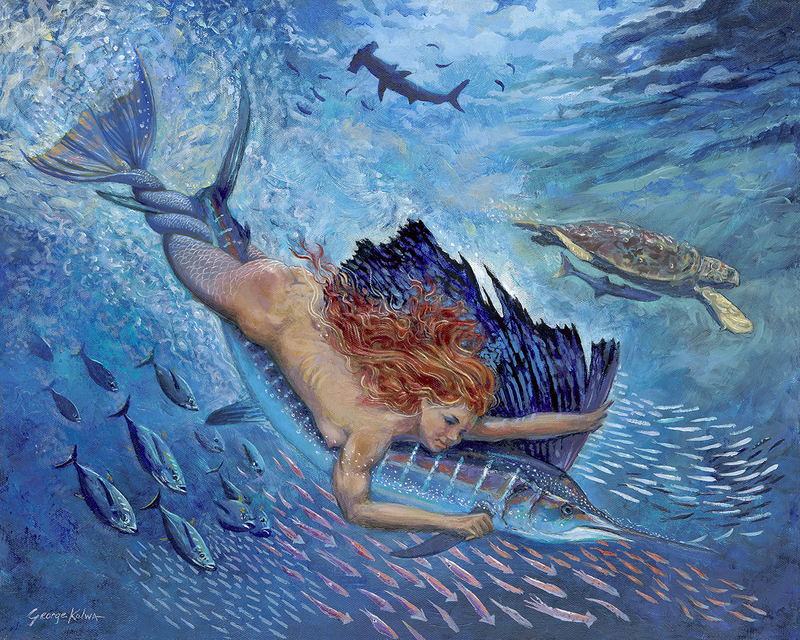 Mermaids must have strong arms and a strong neck. 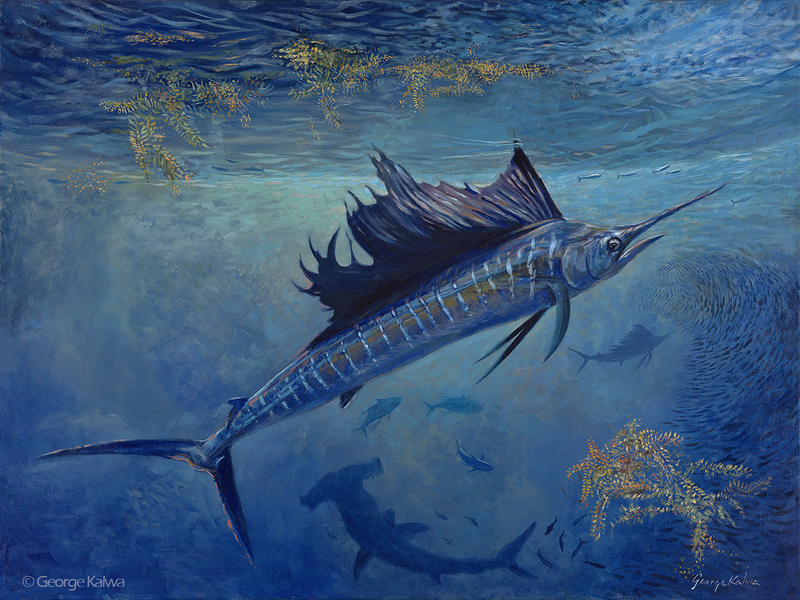 Her tail is lit up so to blend with the sailfish. 9" x 12" Watercolor sketch... 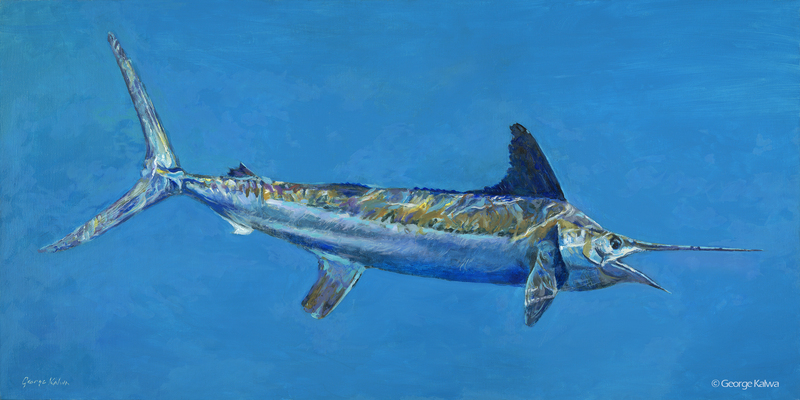 I was fishing for Rockfish at Pooles Island in 1997 when this huge snake-like creature came to the surface within casting distance of my boat. 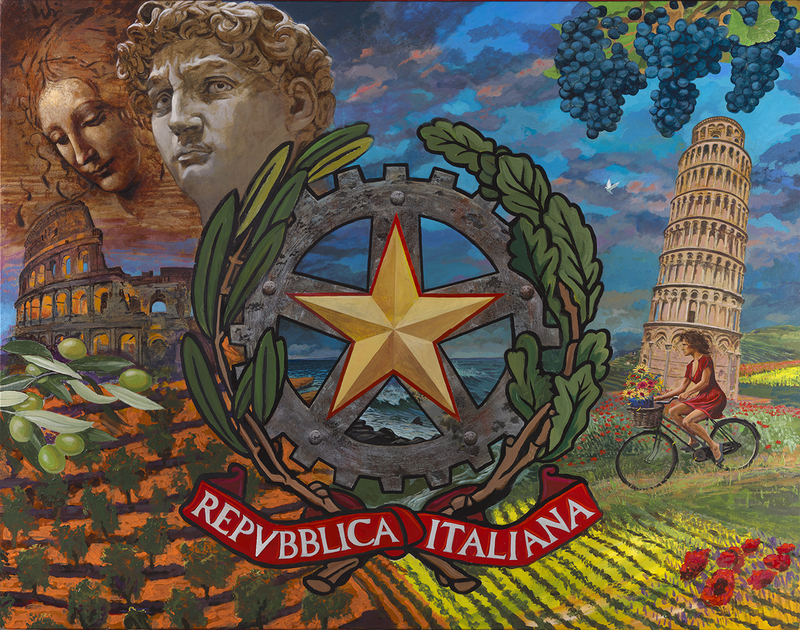 It was smooth with no scales, tan and olive colored skin. I reported it to the DNR when I returned home and later spoke with Bill Burton. Birds getting closer to my boat and were working the area feeding on something. When they got close the creature came up. I didn't get a chance to see his head. 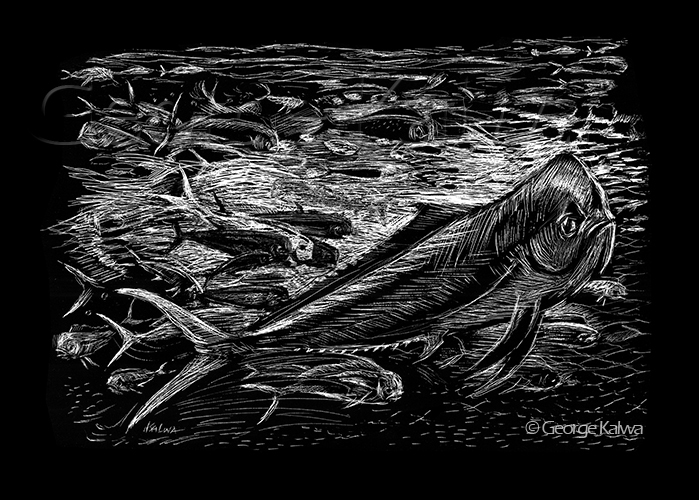 11" x 14" scratchboard ..When I plunged my GoPro camera on a stick down below the surface it revealed thousands of Mahi fish as far as you could see. 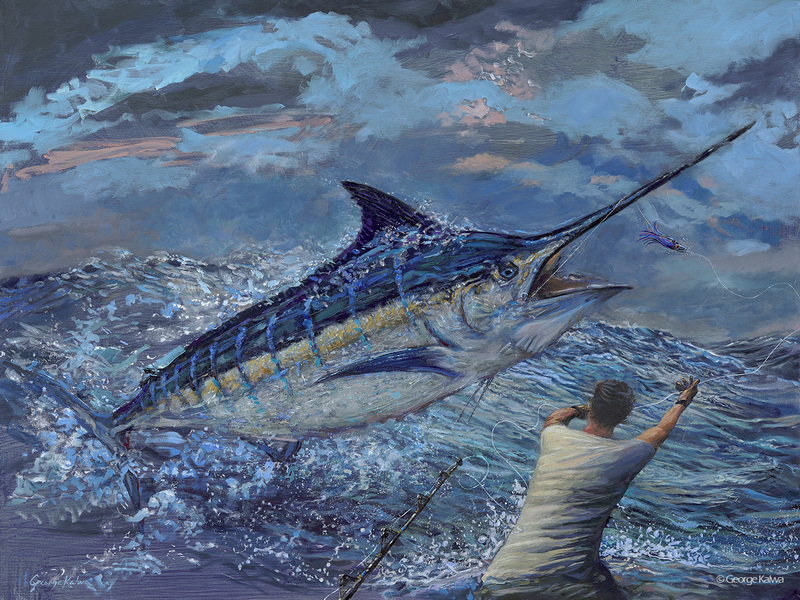 It was a most memorable day in the ocean.